Now, given what the camera has become, given the extent people will go with Photoshopping in the images they post on-line, we can see Arbus’ work in a new light. One closer to what she always intended, where we are the “freaks” and our obsession with our outside tells us so much about what might be missing from our inside. It’s along these lines that Arbus’ work has inspired the talented individuals at the interesting Marquez Laundry Theatre Company. Fred and Ginger is currently on at the 505 Theatre as part of the Sydney Fringe Festival, and is the first piece of theatre I’ve seen performed by the company. Marquez Laundry (great name) is dedicated to a kind of morphing of mediums. Their blurb on line states: Márquez Laundry is a theatre company with the goal of creating stories in multiple visual theatre formats, combining object theatre & puppetry, live music, dance and movement choreography. We strive to touch your hearts and break it a little as well. And with Fred and Ginger they do exactly as they set out to when they say they will touch your heart and break it a little as well. Anon is a “soul” crumbling through time in a moldy loft, the incessant tick-tick-tick of a metronome to remind her of the passing of hours. She is searching for her soul mate, which she understands to be inside herself, but this search is its own journey and Anon can’t control what she finds and loses along the way. Her cries come out in forms of poetic screams and even at times, operatic scenes that she muddles up into arias she calls Fred and Ginger. 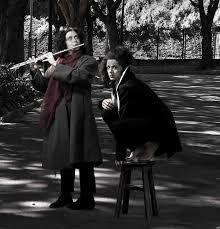 Her solitude is broken by Key, a servile mute who busies herself around Anon, following orders and breaking into beautiful flute solos on command. 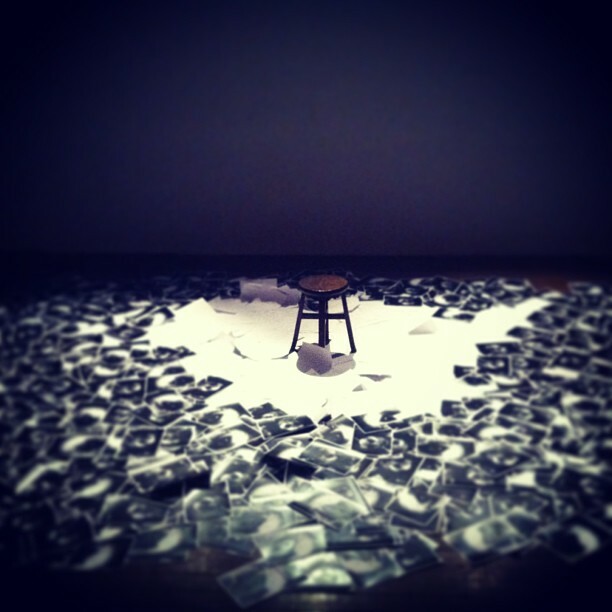 Anon stands on a small wooden stool surrounded by photographs of herself and Key, floating in an ocean of the desperation of self-awareness, as Key distracts herself following the pointless requests that chop and change according to Anon’s ecstatic whims. Fred and Ginger is highly experimental theatre, in that structures an audience cling to such as narrative and character are missing, intentionally left for the individual witness to create. We are given the guidance of Diane Arbus and the lovely photography of Phyllis Wong by way of introduction, but the experience of Fred and Ginger carries its own rewards more in response. I kept thinking of the mad woman in the attic mythology as I watched Anon, perched on her small throne, grasping and reaching for her own personal sky, but that is something I imposed on the work; that came from me to the play. Fred and Ginger is an intimate, movement based communication speaking and reaching into the deepest part of the psyche, hoping to stir, tap and awaken some sleeping giants inside. Like Arbus’ photographs, it is visually lush, erotically charged and eclectic in its permutations. Something deep and dark pulses out of Fred and Ginger, and tendril creeps its way into the mind. As often happens when confronted with something very unique and original, I found the play returning to me at the oddest moments the day after. Alicia Gonzalez is Anon, and her shrieks, calls and cries bounced around inside of me all the next day as I found myself contemplating her fate, and the fate of Key, and at other times jealous of their focus and introspection in a world that constantly made so many demands on me, burying my internal world at the same time. Anon is a puppet-master of sorts. At the surface it looks like she controls Key, but Key’s servitude is conditional in that Anon must always be working on finding the soul mate. Anon is both her own puppet and her own master, and we watch, amazed as Anon, alive in her own kind of madness, as her own personal freak, guides herself on her own search. 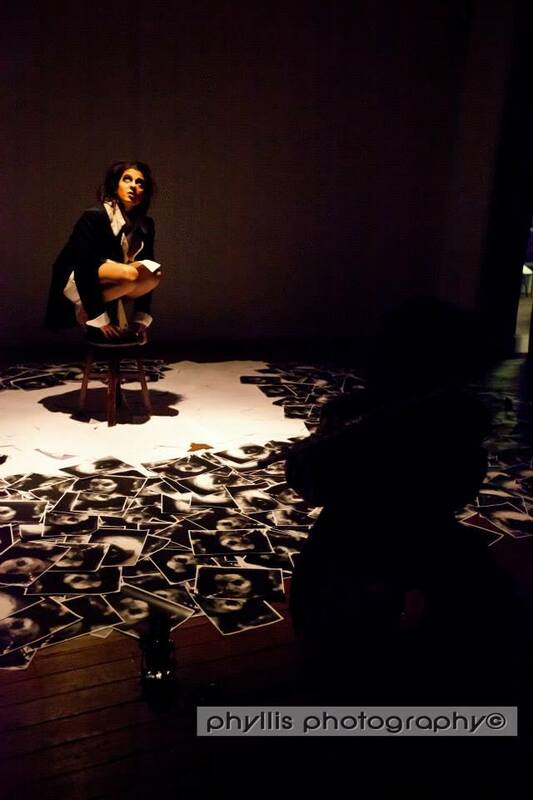 Alicia Gonzalez is an arresting Anon, taking the role inside completely, at once funny, witty and desolate. Keyna Wilkins is a lithe and lovely Key, brusque and bustling at one moment and floating on a cloud of her own music at another. There is an invitation in the program to stay and chat with the members of Marquez Laundry after this production and even though I had to get to another appointment that night, it is highly recommended that you stay. Fred and Ginger is the kind of work that unfolds inside of you, connects you to the other through yourself and I would have loved to stay and chat to the women about what I saw and felt. Fred and Ginger is what the soul and heart of The Fringe Festival is all about: small, unusual acts that find fertile soil inside and set down their fragile roots, from which great things grow. 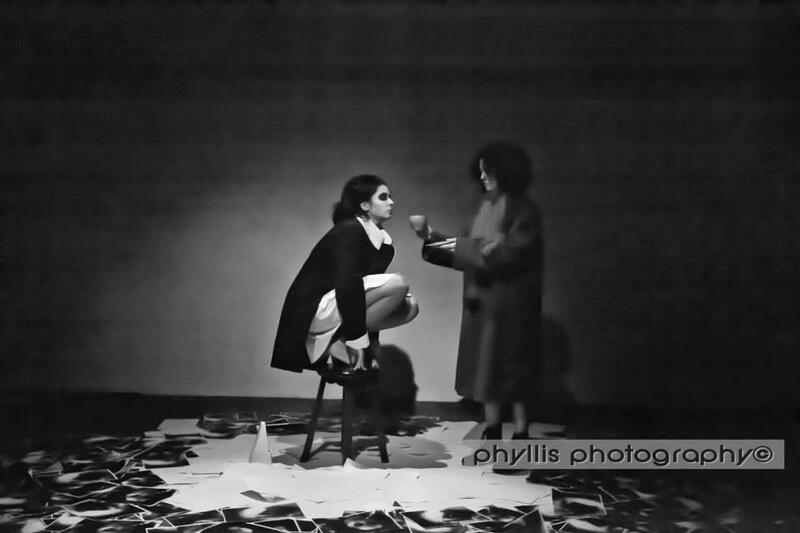 The photography in this post is taken from Phyllis Wong’s images of the production. Fred and Ginger is on at the 505 Theatre from Monday 16 September through to Sunday 22 September. You can grab your tickets here.